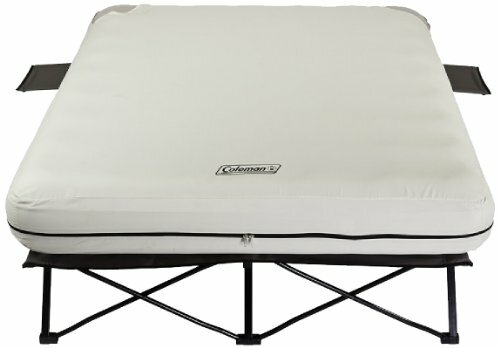 The Coleman SupportRest Double High Airbed has an extra-high design that offers added cushioning and makes it easier to get in and out of the bed. Designed for both indoor and outdoor use, this inflatable mattress is perfect for houseguests or to take on camping trips. The velvet-like plush top offers a soft feel, so you can drift off to sleep in comfort, while the Support Lock reinforced construction lets you enjoy a more stable sleeping surface. Once the mattress is inflated with a Coleman 120V or rechargeable pump (sold separately), the AirTight system and Double Lock valve help keep the mattress at the perfect firmness level. 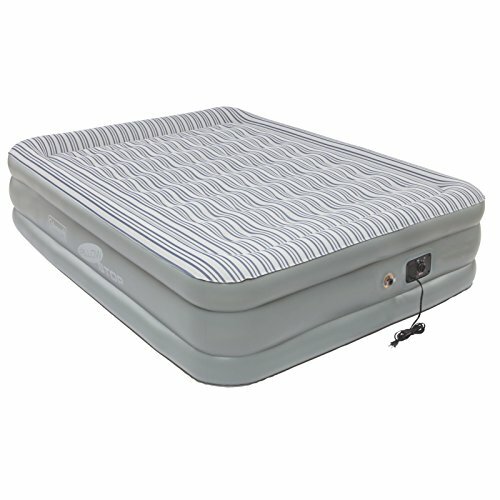 This queen air mattress supports up to 600 pounds and fits standard queen size sheets. An integrated Wrap 'N' Roll storage system allows you to fold, roll, and store the air bed quickly for easy cleanup and storage. Transform any room into a guest bedroom with the Coleman Soft Plush Top Inflated QuickBed Air Bed. Designed for indoor use, this easy-to-use inflatable mattress has a comfortable coil system for extra support and a plush top that is soft to the touch. 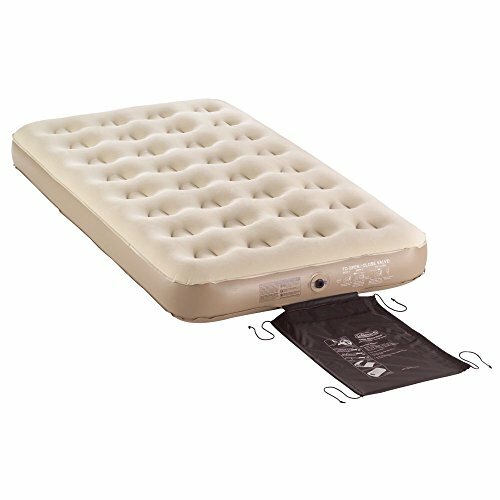 This air mattress features the AirTight system and Double Lock valve to help prevent leaks and ensure your air bed stays inflated. An integrated Wrap 'N' Roll storage system allows you to fold, roll, and store the air bed quickly for easy cleanup and storage. Featuring an extra-tall design, the Coleman SupportRest Elite Double High Airbed offers added cushioning and makes it easier to get in and out of the bed. Designed for both indoor and outdoor use, this inflatable mattress is the perfect choice for houseguests or camping trips. The velvet-like plush top offers a soft feel, so you can drift off to sleep in comfort, while the Support Lock reinforced construction provides a more stable sleeping surface. The mattress surface is antimicrobial treated to resist odor, mold, mildew, and fungus, so you can offer the bed to family and friends with confidence. A convenient built-in SwiftRise 120V performance pump inflates the bed in under two minutes, and an AirTight system and Double Lock valve help keep the mattress at the perfect firmness level. The pump also completely deflates the air bed for easier packing and compact storage, and the included carry bag offers hassle-free transportation. 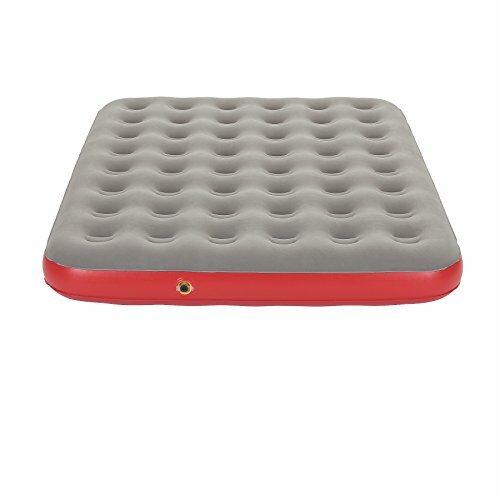 The official air bed of the National Park Foundation, this twin air mattress supports up to 300 pounds and fits standard twin size sheets. The Coleman Double High SupportRest with Electric Pump is the perfect solution to any slumbering requirements. Because it’s constructed from heavy duty PVC materials with the leak-free Coleman Airtight System, this air bed is dependable and durable. The soft, plush sleeping surface ensures luxurious comfort, while the Wrap ‘N’ Roll storage system guarantees simple maintenance. This SupportRest fits standard sheet sizes and comes standard with the 120V Pump. About Coleman Company Inc. Fueled by poor eyesight and blind ambition, W.C. Coleman began his company with the invention of his gas lamps in 1905. Twenty years later, the company saw a country at war and an Army without adequate stoves. The Coleman pocket stove is today considered one of the two most important innovations in non-combat equipment in the war effort. It is this commitment to quality and innovation that continues to push the Coleman brand to create essential and reliable products that are convenient and easy to use. Plush sleeping surface. Heavy duty PVC construction. 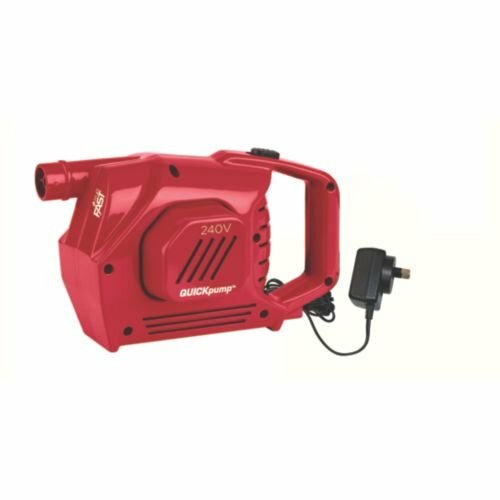 Combo 120V air pump. Features Coleman Airtight System. Available in a variety of sizes. No matter how tough the day was, you'll find relaxing comfort when night falls with a Coleman all-terrain single high airbed. 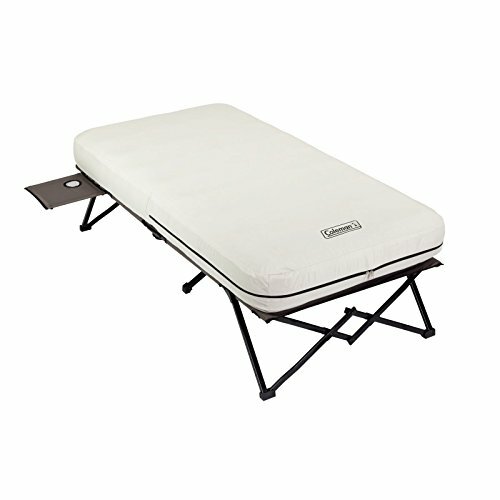 Each all-terrain bed sports a puncture Guard bonded fabric surface that is stronger, lighter and more comfortable, making it the go anywhere, do anything bed. Go ahead, abuse this bed - the fabric layer adds durability and strength to make it 47% more puncture-resistant. Grab your favorite Coleman airbed pump, and you'll always be ready to inflate your bed, indoors or outdoors. Once you find the perfect firmness, the revolutionary construction is 25% more stretch-resistant, so it helps maintain pressure though the night for better support. At the same time the airtight system is factory-tested to be leak-free. The comfortstrong coil construction provides better support, while the fabric provides a soft-touch surface to offer relaxation after a long day. When you're ready to go, the wrap 'n' roll built-in storage system makes packing up simple until you're ready for your next adventure. 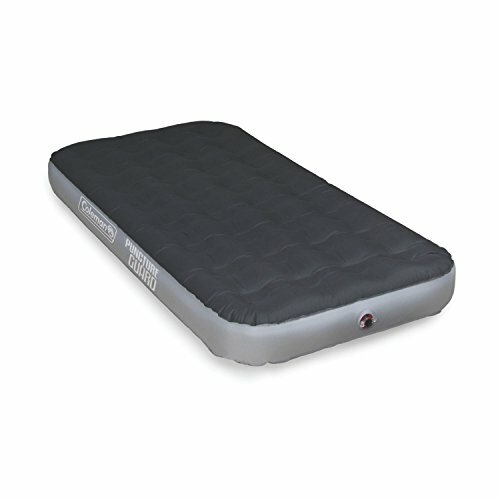 The Coleman SupportRest Elite PillowStop Double High Airbed features a raised edge at the head of the bed to help keep your pillows in place, so they're still under your head when you wake up in the morning. The ComfortStrong coil system and Support Lock reinforced construction provide better support, so you wake up feeling rested, while the extra height offers added cushioning and makes it easier to get in and out of the bed. 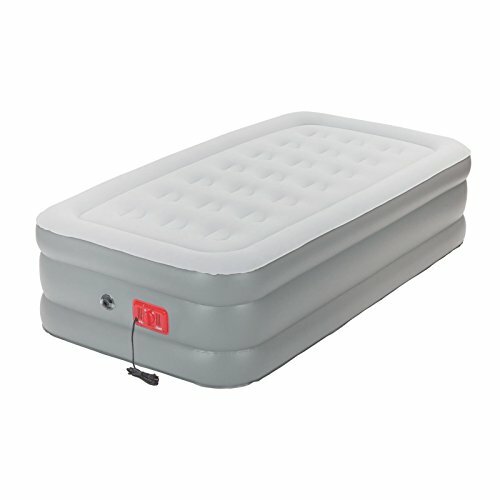 An integrated 120V pump allows you to easily inflate the air bed at home or on the go, and an AirTight system and Double Lock valve help keep the mattress at the perfect level of firmness. Factory tested to be leak-free, this queen air mattress supports up to 600 pounds and fits standard queen size sheets. It comes with a carry bag for easy storage and portability. 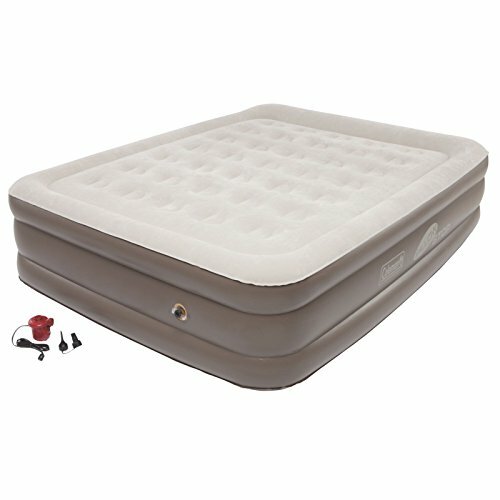 Compare prices on Coleman Air Bed at ShopPlanetUp.com – use promo codes and coupons for best offers and deals. We work hard to get you amazing deals and collect all available offers online and represent it in one place for the customers. Now our visitors can leverage benefits of big brands and heavy discounts available for that day and for famous brands.